Unlike most plants, hollies (Ilex spp.) are at their best in the winter months. When everything else in the garden is drab and grey, holly's lustrous green leaves and bright red berries are especially cheerful - one reason this plant is so often associated with the holiday season. There are many types of hollies, ranging from short groundcovers to 50-foot trees. 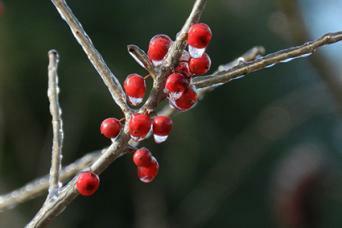 The most common hollies used in landscaping are evergreen shrubs with prickly leaves and winter time fruit. Besides brightening the garden in December and January, the berries are an important source of sustenance for wildlife at this time of year. However, the berries should not be consumed by humans. Holly flowers are inconspicuous, but it is important to realize that most species require cross-pollination to produce fruit. Check the label when buying holly plants and make sure to get a combination of male and female specimens - only females will have berries on most hollies, but the males are needed for pollination. Hollies grow well in either full sun or partial shade and prefer well-drained soil. The soil pH needs to be on the acidic side, between 5 and 6. Consider this round-up of the top evergreen hollies for your yard, with one to fit almost every imaginable landscaping situation. They are among the most widely available landscaping plants, so finding one at your local nursery shouldn't be a problem. This is the classic species used in holiday decorating and makes a great specimen tree in the landscape with its upright, pyramidal growth habit. It grows into an enormous tree in the wild, but most landscaping cultivars are in the 20 to 30 foot range (including those listed below). This is a very shade tolerant species and is often used for landscaping under taller shade trees. 'Old Heavy Berry' is noted for its copious berry production and is hardy in USDA zones 5 to 9. 'Stewart's Silver Crown' is hardy in USDA zones 6 to 9 and has leaves that are edged in a creamy white color. 'Yellow Berry' is a selection with yellow fruit; it is hardy in USDA zones 5 to 9. Similar to the American species in appearance but smaller, Chinese hollies are generally in the 10 to 20 foot range and are often used as a fast-growing screen. Both cultivars are hardy in USDA zones 7 through 9. 'Burford' grows to 15 feet tall and 10 feet wide and is one of the few hollies available that does no need cross-pollination. 'Needle Point' is similar but has slender leaves with a single point at the tip. 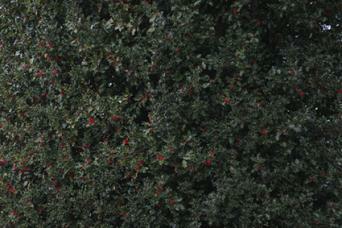 Japanese holly cultivars are among the smallest available, typically growing to 10 feet or less. They also lack the spines and red berries that are associated with other hollies, instead bearing small black fruit and oval, thornless leaves less than an inch in length. The following are used as low hedges and foundation plants. 'Heitzi' is a dwarf form, growing just two to three feet tall and wide. It's hardy in USDA zones 5 to 8. 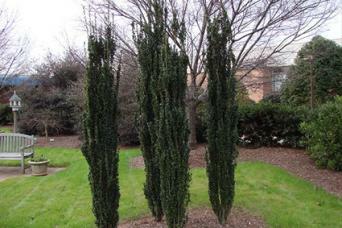 'Sky Pencil' is a columnar variety, growing two to three feet wide and 10 feet tall and is hardy in USDA zones 5 to 9. This variety also has small oval-shaped, thornless leaves and is native to coastal areas of eastern North America. 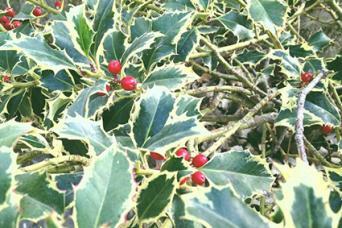 It is the only type of holly that is tolerant of poorly drained soils. In the wild, yaupon holly grows as a shrub 10 feet tall and wide, but the size and growth habit of its landscaping cultivars varies considerably. Both hollies are hardy in USDA zones 7 to 10. 'Nana' grows three feet tall and spreads at least twice as wide. 'Pendula' is weeping variety growing 15 tall and six feet wide. 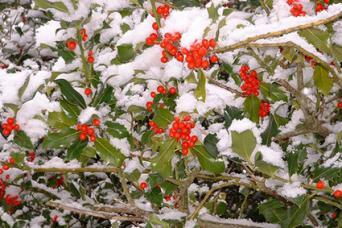 There are several holly species that lose their leaves in winter. The following cultivars, hardy in USDA zones 4 to 8, are among those most commonly used in landscaping. 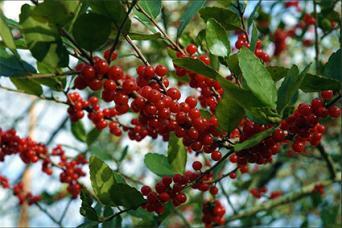 'Sparkleberry' grows eight to 10 feet tall and wide with thornless leaves and tons of red berries that hang on the branches all winter. 'Red Sprite' is similar but grows to just three feet tall and wide. Hollies need weekly water to get established and mature plantings should get a deep soaking during dry spells of two weeks or more. They also benefit from an application of all-purpose fertilizer, once in spring and again in late summer. A mulch of compost each fall is a great way to keep your hollies thriving. If the leaves turn pale green or yellow, but the veins remain dark green, it is a sign that the soil is not acidic enough. Applications of iron chelate is the best remedy for this common holly problem. Many hollies take on an attractive form without any pruning or training, but overall it's a group of plants that often requires this type of maintenance. 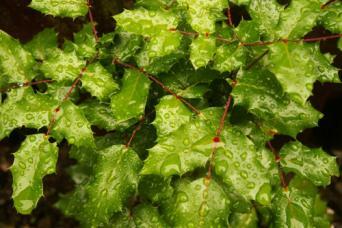 All the smaller holly shrubs can be sheared to maintain their size and create a uniform appearance. This is a spring through fall activity that is typically needed one to four times per month depending on the growth rate of the shrub and the aesthetic taste of the gardener. Tree form hollies often sprout from the base of the trunk - these can be removed as they appear. It's also possible to reduce the size of any holly that has grown to large for its location by cutting it back to the desired height in fall. Hollies are generally quite robust when their growing requirements are provided for. Poor drainage will lead to root rot and overfertilization can make the plants attractive to sucking insects. The most common pests are scale and aphids. The plants usually survive with little to no harm though these pests secrete sticky substances that can stain surfaces beneath hollies. On small specimens these pests can be controlled with insecticidal sprays, but on larger specimens their presence is generally tolerated, as eradication is impractical. Hollies fill so many niches in the landscape and do it with grace and minimal maintenance from the gardener. They are a wonderful asset in winter when their branches make a lovely addition to seasonal displays indoors.